Beef prices, already at near-record-high prices, are expected to be driven up for the second year in a row this year because of a limited supply of cattle. An old interview but relevant this week as the FED clearly states they plan to keep interest rates low and basically keep printing money to bailout who ever? It still amazes me that these commentators continue to support these money printing policies, because they must be shopping and buying gas just like everyone else, and don't they see prices rising? Silver is currently rather depressed in relation to its recent high, and unless we have seen the end of the 11-year bull market for precious metals then ought to be consolidating for another leap higher. That has been the pattern of volatile, wild price swings that we have come to expect from this precious metal. Not because of the violence of bad men. But because of the silence of good people." For twelve years gold and silver have been in a bull market. Gold has shown an average annual return of approximately 20% per year, even when measured in various global currencies, it has outperformed every other asset class in the past decade. The 70's saw gold rise from $35/oz to a high of $850/oz in 1980, that's a multiple of 24 times. Applying that multiple in this decades bull run, it would take gold from a low of $250/oz in 1999 to a high of $6,000/oz! With gold trading in the $1,650 range today, we're not even close to "BUBBLE" territory or a peak in gold. Just ask yourself how many people you know that own gold bullion, and I don't mean ETF's, paper certificates or trusts, but the actual physical bullion? Probably very few? Besides the global economy was much different in the 70's. Chinese and Russian citizens were not even allowed to own gold. 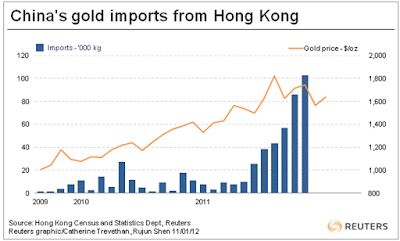 Now, China is actively promoting gold investments to its citizens. The USA was a creditor nation, now it's the largest debtor nation in the history of the world, with debt exceeding, hold on to your hats...$15 TRILLION! The problem is many fail to realize this bull market in gold is not about gold, it's about the USD losing confidence as the world's reserve curreny. Throughout history many countries have lost this status, from the great Roman times to the British empire. Paper currencies always, and without fail, eventually return to their intrinsic value of ZERO. However, gold is actually insurance and a true measure of wealth, that cannot be challenged. It has outlasted every government, currency, bank or stock market that has ever existed. Gold is the only unit of measure or medium of exchange that has survived throughout history as money. WHY, because of its natural composition. Gold cannot be destroyed, cannot be counterfeit, has no counterparty risk, cannot rust or tarnish, it's evenly divisible, fungible, transportable, very rare, globally recognized as a store of value and it takes real labout to produce, unlike paper or digital currencies created by central banks. Yes, of course gold and silver do not produce interest or dividends, but they're not supposed to because they are a unit of account, a measure of real wealth or MONEY! Besides, take a look at your "balanced and diversified" portfolio and compare it to gold & silver and the "cost of living," and ask yourself if you're doing any better? Gold is the only true method of protecting your wealth from the continuous inflationary policies of all central banks printing money and expanding credit. Besides, central banks keep gold in reserve, why not YOU! become your own central bank! In 1970 $35 buys 1oz of gold or 140 loafs of bread. In 2012 $35 buys 0.02oz of gold or ONLY 10 loafs of bread. However, 1oz of gold today ($1,650) buys 470 loafs of bread. So what is a true STORE OF VALUE for any generation? Thomson Reuters GFMS annual gold survey released today shows that global investment increased 20% last year to $80 billion, leading to the nominal high last September of $1,920/oz. This is primarily attributed to the physical buying of bullion. ECB's Chief Warns Situation Is "Very Grave"
FRANKFURT—European Central Bank President Mario Draghi delivered his sternest warning to date on Europe's debt crisis, saying it could cripple financial markets and the economy unless effective actions are taken by governments. "We are in a very grave state of affairs and we must not shy away from this fact," Mr. Draghi said in testimony to the European Parliament. By Mark Motive, publisher and chief author of Plan B Economics. Yes that's very nice Professor, HOWEVER, one thing is for "certain," gold has outlasted every government, currency, stock market, bank or financial institution that has ever existed. It remains the only true unit of measure for wealth because of it's natural composition. It cannot be destroyed, counterfeit, corroded or just created on a balance sheet like fiat paper currency. It's very rare, evenly divisible, fungible, transportable, it requires hard physical labour to produce and is recognized as money around the world. People go to gold because they lose trust and confidence in paper assets, and lately I don't blame them. It's NOT about gold, it's about a system gone mad.